We’ve had quite a few electrically-assisted bicycles featured here. 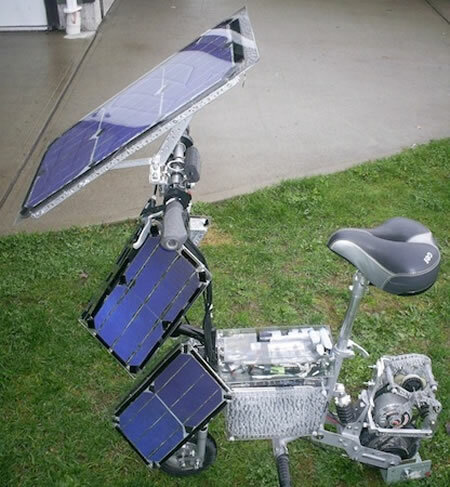 This one sure as hell takes the cake though, given that it’s a pretty neat DIY way to travelling green. Built by EV inventor and enthusiast Terry Hope, this Specialized FSR bike was converted into an e-bike, christened the Solar Cross, in just a couple of weeks. Sporting a custom freewheel crank with three sprockets, with the 80T (tooth) chain sprocket hooked on to the electric motor drive, this one uses energy from the sun with solar panels fitted on to its framework to trickle in charge into an onboard battery, that juices up the motor. 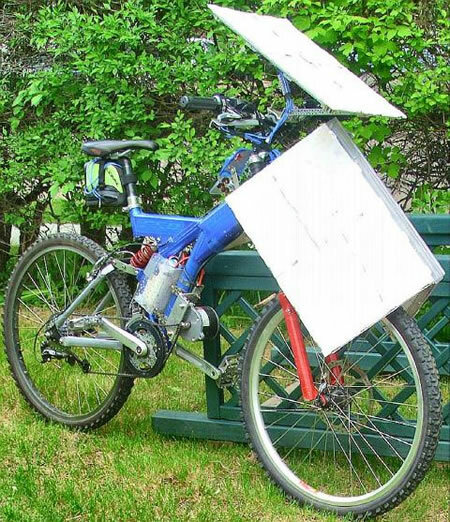 However, the motor cannot power up the bike alone. It does however assist you at higher speeds, allowing you to pedal like an 18 speed bike, with the motor assisting you go fast! All in all, the bike seems to be a pretty great way to get around without polluting the earth, and without tiring the living daylights out of your legs. A bunch of thin-film flexible cells integrated in the body would do better though, given that those solar panels seem to be an eye-sore.